Happy Saturday everyone!! 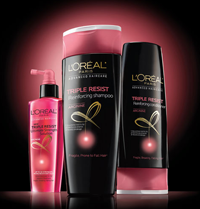 I have another freebie to let you know about today and this one is for FREE L’Oreal Paris Advanced Shampoo and Conditioner Samples! Login or register and select which sample you would like and confirm your contact info in their form to receive your free sample. Enjoy!